The design uses gamma family error spending functions with for the upper boundary, for the lower boundary, and for the lower and upper boundaries. The "Design Information" table in Output 101.12.1 displays design specifications and the derived maximum information. Note that in order to attain the same information level for the asymmetric lower and upper boundaries, the derived power at the upper alternative 0.93655 is larger than the specified . The "Method Information" table in Output 101.11.2 displays the specified and error levels and the derived drift parameter. With the same information level used for the asymmetric lower and upper boundaries, only one of the levels is maintained and the other is derived to have the level less than or equal to the specified level. With the STOPPROB(CREF=0 1) option, the "Expected Cumulative Stopping Probabilities" table in Output 101.12.3 displays the expected stopping stage and cumulative stopping probabilities at each stage under the null reference and under the alternative reference . "Rej Null (Lower Alt)" and "Rej Null (Upper Alt)" under the heading "Source" indicate the probabilities of rejecting the null hypothesis for the lower alternative and for the upper alternative, respectively. "Reject Null" indicates the probability of rejecting the null hypothesis for either the lower or upper alternative, "Accept Null" indicates the probability of accepting the null hypothesis, and "Total" indicates the total probability of stopping the trial. With the PSS(CREF=0 0.5 1.0) option, the "Power and Expected Sample Sizes" table in Output 101.12.4 displays powers and expected sample sizes under hypothetical references (null hypothesis ), , and (alternative hypothesis ), where is the alternative reference. The expected sample sizes are displayed in a scale that indicates a percentage of its corresponding fixed-sample size design. Note that at , the null reference , the power with the lower alternative is the lower error 0.025, and the power with the upper alternative is the upper error 0.025. 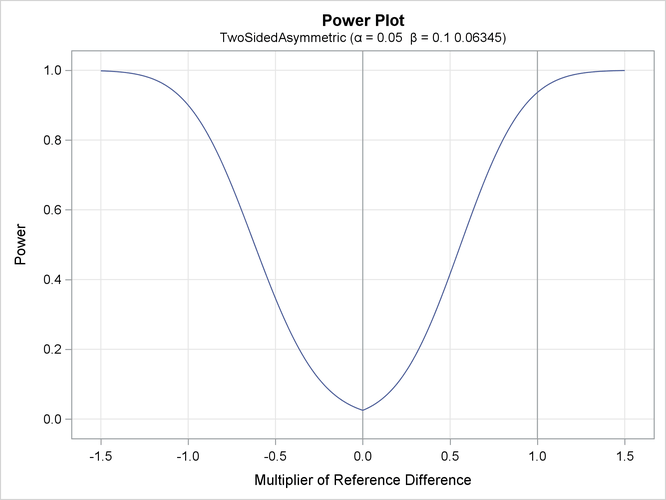 At , the alternative reference , the power with the lower alternative is the specified power 0.90, and the power with the upper alternative 0.93655 is greater than the specified power 0.90 because the same information level is used for these two asymmetric boundaries. With the PLOTS=POWER option, the procedure displays a plot of the power curves under various hypothetical references, as shown in Output 101.12.5. By default, powers under the lower hypotheses and under the upper hypotheses , are displayed for a two-sided asymmetric design, where and and are the lower and upper alternative references, respectively. The horizontal axis displays the multiplier of the reference difference. A positive multiplier corresponds to for the upper alternative hypothesis, and a negative multiplier corresponds to for the lower alternative hypothesis. For lower reference hypotheses, the power is the lower error 0.025 under the null hypothesis ( ) and is 0.90 under the alternative hypothesis ( ). For upper reference hypotheses, the power is the upper error 0.025 under the null hypothesis ( ) and is 0.93655 under the alternative hypothesis ( ). With the PLOTS=ASN option, the procedure displays a plot of expected sample sizes under various hypothetical references, as shown in Output 101.12.6. 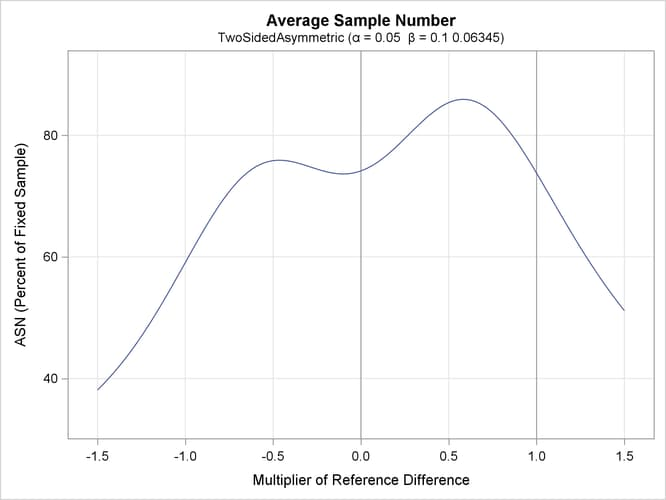 By default, expected sample sizes under the lower hypotheses and under the upper hypotheses are displayed for a two-sided asymmetric design, where and and are the lower and upper alternative references, respectively. The horizontal axis displays the multiplier of the reference difference. A positive multiplier corresponds to for the upper alternative hypothesis, and a negative multiplier corresponds to for the lower alternative hypothesis. By default (or equivalently if you specify BETAOVERLAP=ADJUST), the SEQDESIGN procedure first derives boundary values without adjusting for the possible overlapping of the two one-sided boundaries based on two corresponding one-sided tests. Then the procedure checks for overlapping of the boundaries at the interim stages. 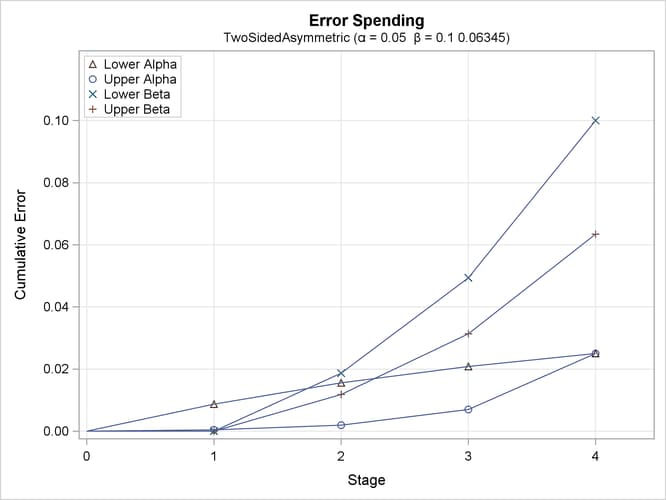 Since the two boundaries overlap at stage 1, the boundary values for stage 1 are set to missing, the spending values at stage 1 are set to zero, and the spending values at subsequent stages are adjusted proportionally. The "Boundary Information" table in Output 101.12.7 displays the information levels, alternative references, and boundary values. By default (or equivalently if you specify BOUNDARYSCALE=STDZ), the standardized Z scale is used to display the alternative references and boundary values. The resulting standardized alternative references at stage k is given by , where is the specified alternative reference and is the information level at stage k, . 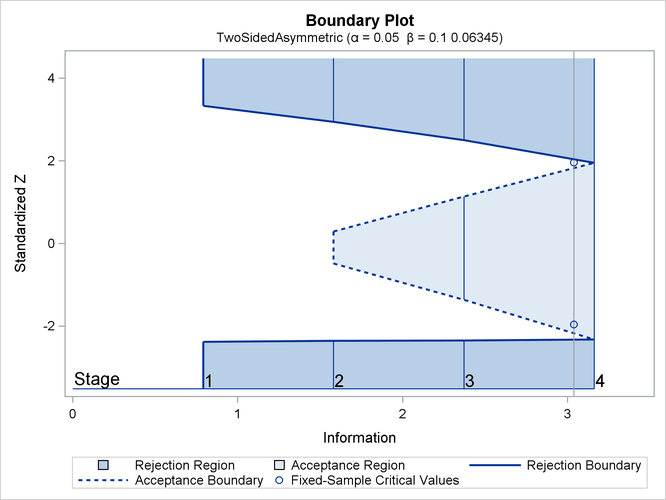 With ODS Graphics enabled, a detailed boundary plot with the rejection and acceptance regions is displayed, as shown in Output 101.12.8. The "Error Spending Information" in Output 101.12.9 displays the cumulative error spending at each stage for each boundary. With the boundary values missing at stage 1, there is no early stopping to accept at stage 1, and the corresponding spending at stage 1 is computed from the rejection region. For example, the upper spending at stage 1 (0.00002) is the probability of rejecting for the lower alternative under the upper alternative reference. With the PLOTS=ERRSPEND option, the procedure displays a plot of the cumulative error spending on each boundary at each stage, as shown in Output 101.12.10.